The R-PLEX Human proMMP-9 Antibody Set includes a matched capture and detection antibody pair and calibrator for the quick and easy measurement of proMMP-9 in biological samples. R-PLEX products leverage MSD’s electrochemiluminescence technology for better sensitivity and a larger dynamic range than traditional ELISAs. R-PLEX matched antibody sets enable the development of singleplex and multiplex immunoassays. Individual assays may be developed using MSD avidin- or streptavidin-coated plates. Custom multiplex assays with any combination of R-PLEX analytes, as well as R-PLEX plus U-PLEX analytes can be developed on U-PLEX MULTI-SPOT plates. To learn more about the advantages of R-PLEX products click here. 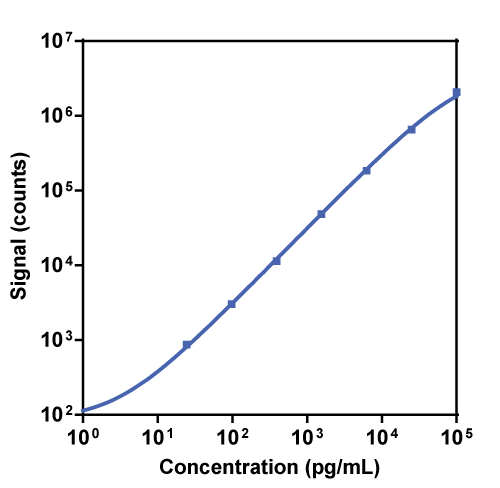 Calibration curve for the R-PLEX Human proMMP-9 Antibody Set was assessed and representative data are presented below. Description - proMatrix MetalloProteinase 9 (proMMP-9, GELB, CLG4B, MANDP2, 92kDa type IV collagenase) is an endoproteinase which is important in matrix remodeling. MMPs are highly homologous. MMP-9 degrades interstitial proteins and can also cleave non-matrix molecules such as IL-1β and IL-8. MMP-9 is secreted as a proenzyme (proMMP-9) that is activated by extracellular proteinases including MMP-3. proMMP-9 binds to TIMP-1, which protects it from being activated by MMP-3. The proMMP-9:TIMP-1 complex is able to inhibit other MMPs. proMMP-9 can also covalently bind to NGAL, which locks it in the inactive state.